Camshaft sprocket holding tool 1 – No.KM-6347. Camshaft sprocket holding tool 2 – No.KM-956-1. Camshaft locking tool(s) – No.EN-46781. Tensioner locking tool – No.KM-955. Crankshaft pulley hub holder – No.KM-662-C. Crankshaft locking pin – No.EN-46785. Remove blanking plugs from camshaft housing  . Install camshaft locking tools  . Flat sections on camshaft locking tools must be in horizontal position  . NOTE: Mark position of flat sections on camshaft locking tools with paint before installation  . 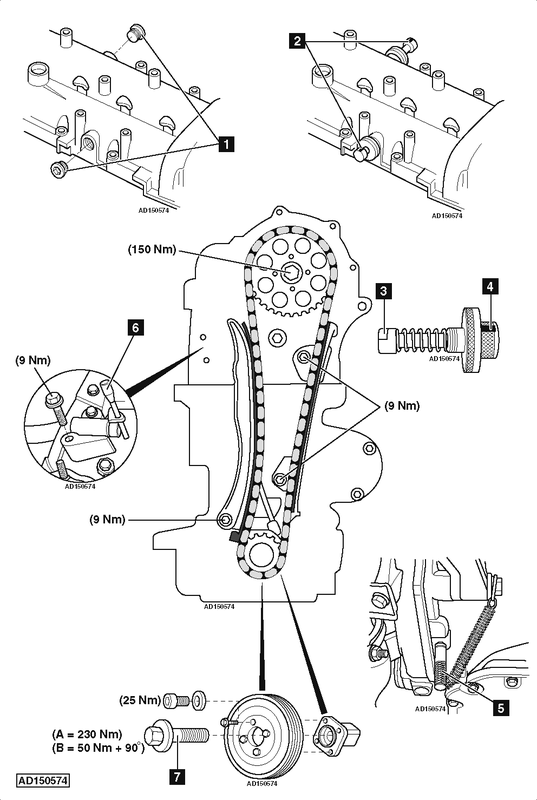 Turn crankshaft in direction of rotation until both camshaft locking tools are heard to engage. Install crankshaft locking pin in bell housing hole  . Install tensioner locking tool before carrying out engine repairs  . A = Agila/Agila-B/Astra-H/Meriva: 230 Nm. B = Corsa-C/Combo-C/Corsa-D/Tigra-B: 50 Nm + 90°. Use new bolt. NOTE: Crankshaft pulley hub bolt has LH thread.